Do you remember the 1980’s? I know for a fact that two of the weekend’s most prominent racecourse celebrants will do. Of course, you need to be of a certain vintage and not be shy of revealing it. Joanna Lumley didn’t mind letting the world know she’s arrived at the same age (albeit eight weeks after) as me and even had a race at the Curragh yesterday to commemorate her reaching 70, and staged at 4.10 p.m. to coincide with the time of her birth on May 1, 1946. They say the sun shines on the righteous and Joanna, a public figure for the past 50-odd years not just for her acting and before that modelling careers, deserves that description. Over the years she’s been a vociferous supporter of animal protection causes, and back in 1980 was a strong voice in the campaign for the ending of the practice of culling baby seals. One day she appeared on the ITV day-time show Afternoon Plus talking about that heart-felt cause. It was on the day before the opening of the 1980 turf season at Doncaster and one of her fellow guests on the show was David Soul, the good-looking blond part of the popular TV cop series, Starsky and Hutch. Now a British subject, he’s three years older than Ms Lumley. For variety they also had the Ombudsman, Sir Cecil Clothier, a trained lawyer, who was the first to hold the post (1979-1984) and dealt principally with matters within the National Health Service. They all had their few minutes’ chatting to Mavis Nicholson, and then for the opening of the Flat – maybe incongruously - there was me. Not Lord Oaksey, not John McCririck, nor any of the regulars, all presumably on the way to their hotels up in South Yorkshire. Imagine the panic at Thames TV. Who can we get? Someone says a name, never heard of him, but that was it. We all met beforehand and the images remain a little fragmented, but the one sensation that does endure is the unbelievable firmness of the Soul handshake. Only two others in my life have been anywhere near as bone-crushing: the late Irish trainer Barry Kelly and Gold Cup-winning jockey Mark Dwyer, who I always keep a few yards away when I see him at the sales or races. The sun came out just in time for Joanna to make her regal progress around the Curragh yesterday, as it did down the road at the K Club for the triumphal last hole affirmation of Rory McIlroy’s first Irish Open after days of incessant rain which several times halted play at the links and played havoc with the going at the races. 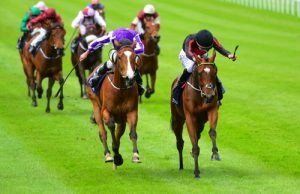 The day before, trainer Clive Cox was worried that the same weather system, around 170 miles to the east at Haydock Park, would have prejudiced the chance of his improving sprinter, Profitable, in the Temple Stakes. A decisive winner of the Group 3 Palace House Stakes on his previous outing, he was fancied to follow up one level higher, until the rains came and increased confidence in last year’s Nunthorpe winner and local heroine, Mecca’s Angel. In the end Profitable prevailed narrowly, much to the obvious irritation of the assembled televisual and written local media. They reckoned Mecca’s Angel should have got the verdict in the stewards’ room after Profitable had edged right to left across the track in the closing stages. Tight enough for there to be a long debate by the officials, but when confirmed it maintained owner Alan Spence’s great run this year where he has had nine wins at a 31% clip. Spence has a number of distinctions in the Travel Business, where he made his money, notably as a Hall of Fame member in their association, for which he is a past President. Born in 1947, he’ll never catch me up, but one connection we have is that in 1984, a horse he sold me for £1,000, won his only race in my colours at my favourite northern track, Beverley. His lead-in picture, with Simon Whitworth up, shares pride of place among the family photos in the lounge as it was the first in the red and white. I once asked him, “Who was Charlie Kilgour?” – the horse’s name. “I’ve no idea,” he replied, “he already had the name when I got him.” Sadly Charlie Kilgour, bought in the auction after the selling-handicap win, had just one unsuccessful run for his new connections, before presumably going lame. While the rain didn’t stop Profitable, it was almost certainly a factor in the string of big-race upsets either side of the Atlantic. At Baltimore’s Pimlico racecourse, any hopes of a second successive Triple Crown following American Pharoah last year, ended when the previously-unbeaten Nyquist failed to make it five wins in a row over Exaggerator, who comfortably turned around the Kentucky Derby form. The main factor here was that Nyquist tried to make a fast pace, but had company all the way around. That allowed Kent Desormeaux to make ground relentlessly up the amazingly unopposed inside route – imagine that at Chester – going clear in the last furlong. The track was muddy there and possibly had something - or a lot - to do with the outcome. Both Irish Guineas Classics also featured a change in the order of things. Awtaad, beaten into third on his juvenile debut last year, won successively a maiden, handicap and then Listed race, and now improved to defeat Newmarket hero, Galileo Gold, in Saturday’s 2,000 Guineas as the Aidan O’Brien quartet toiled in their wake. On a weekend for the oldies, his trainer Kevin Prendergast, winning the race for the second time, is 83. Then Minding, a late substitute for the original Aidan O’Brien number one, the indisposed Ballydoyle, was almost unopposed in the market at 4-11 but proved unable to hold Jet Setting as the pair came home ten lengths ahead of Now or Never and the rest in yesterday’s 1,000 Guineas. Now or Never had new Qatari ownership for the first time after an impressive trial win under Kieren Fallon, but the winner was acquired for a tiny fraction of the sum that must have been paid for that transfer of ownership. Originally bought as a foal for £7,000 by Julie Wood, Jet Setting ran a few decent races without winning from the Richard Hannon stable, and changed hands last autumn for just £12,600. Her owners, Equine Growth Partners, and trainer, Adrian Keatley, now have a filly worth upwards of 100 times as much. Minding was not helped by her banging her head on the stalls as she set off yesterday, causing her to bleed from her sinus. Her many supporters will be hoping that she will be fit to fulfil her role as Oaks favourite, not least the Jet Setters, who can contemplate a further hike in their filly’s value if Minding bounces back at Epsom.